Christmas is so close I can almost touch it, but I always try to restrain myself from diving headfirst into tinsel before December starts. I'm not saying I necessarily succeed, but I try. Part of it is superstition - as though any premature burst of "Deck the halls" will set off a tripwire and whirl us into pre-Aslan Narnia, always winter but never Christmas. Part is gleeful anticipation - like when a present is so beautifully wrapped, you don't quite want to open it. And part is just plain good sense. When December gets here, you won't be able to move in this house for baubles. For the sake of my own sanity and the glitter filter on the hoover, I need to restrict the festivities as far as possible to the period between 1 December and 6 January. That's where America really has things sorted. Thanksgiving would provide the perfect distraction for this time of year - not to mention another excuse for seasonal decorating (have you seen all the pumpkins on Pinterest? ), a few days off work and a belt-busting meal. I may never have been to a proper Thanksgiving dinner - and yes, American friends, that is a massive hint - but I feel like I've absorbed enough Stateside media to bring a bit of Thanksgiving spirit to the blog. In this brief pause before the bells are jingled and Frosty's a snowman, here are a few things I'm thankful for. Liz Earle Cleanse and Polish face wash. I've been using it for years so trust me when I say that this stuff works miracles. If I'm ever out of reach of hot water, my skin reverts to cavegirl state instantly, but a few days of Liz and it's clear, soft and glowing. I keep three back-up tubes under the bed at any one time. Adam and Joe's 6 Music podcasts. Yes, I know they're a few years old, but have you listened to them? Did you (retro) text the nation, tell a travelling tale or popropriate? Do you catch yourself singing anything from Song Wars in meetings - Margaret Mountford, her hair is like a cloud, or the Sontom of Quolace? I just...you've got to...there are no words. They make my commute approximately 98 times better. I may end up trying to stifle giggles inside my scarf but that's a nice way to feel before 8 in the morning. Great British Bake Off. Do I really need to say more? I love it. It's a fragrant bubble bath of a programme, wrapped in warm fluffy slippers. I want to be Mary Berry when I grow up. Deborah Lippman nail varnish with - wait for it - three different sizes of gold glitter. I LOVE this nail varnish. For almost two months, week after week, I have been redoing my nails in the exact same way - clear, boring and professional, with disco crazy glittery tips. Yes, the varnish cost a ridiculous amount but really, who can put a price on joy? Sequins - nuff said. Life is better when it's sparkly. Hot water bottles. Champagne in fancy glasses. Lighting the fire. The feeling when you cross something off a to do list. 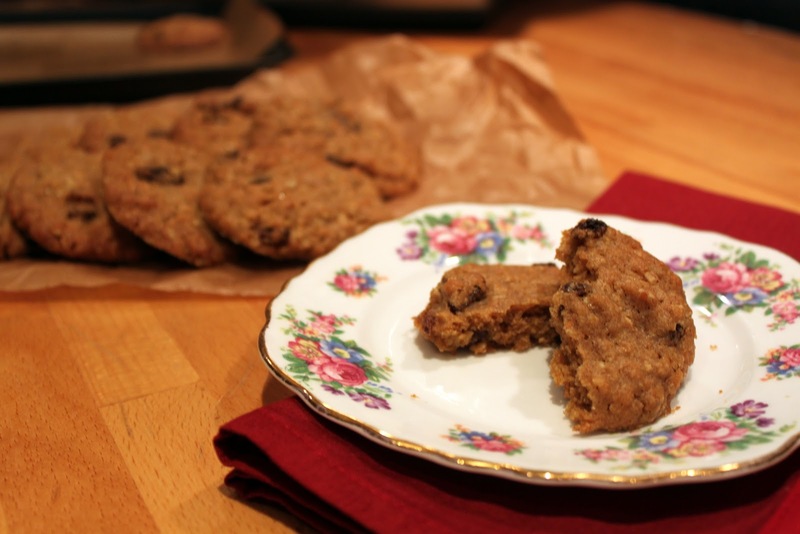 And - finally getting to the point - chewy, squidgy, oaty, fruity, spicy cookies which totally surpass expectations and immediately earn a spot on the "Make Again" list. Not to mention, of course, the fact that hundreds of people actually come here every day and read my disjointed blatherings. I can't tell you how thankful that makes me feel, but I raise a cookie (to my mouth and eat it) in your honour. Start by beating the butter and both sugars together until very soft and creamy, then add the egg and vanilla and beat in. Measure out the spices, flour, baking powder, salt and porridge oats into a bowl, mix well, then add to the buttery sugary eggy mixture and combine (if you're using an electric mixer, you can go up to this point with the machine). 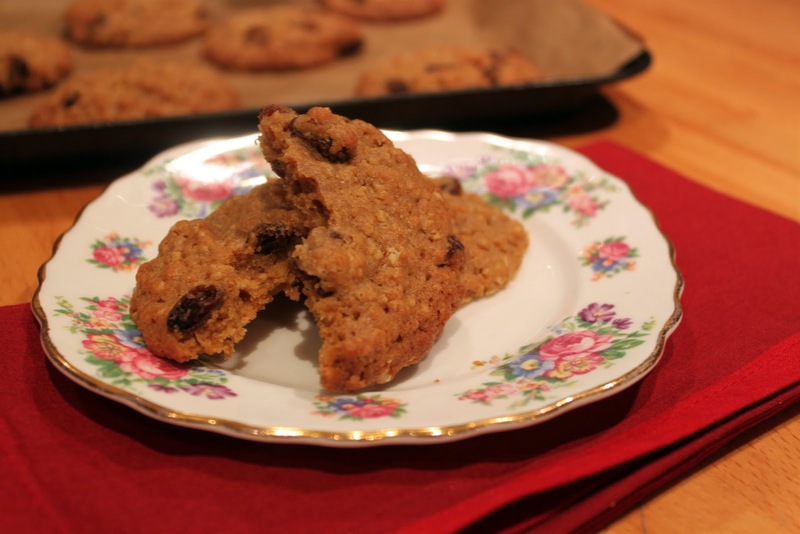 Finally, stir in the raisins (and chocolate chips, if using). The mixture is fairly thick, but that's good. Set the bowl in the fridge for 15-20 minutes (or up to a few hours) and preheat the oven to 180C. Line a few baking trays with parchment. After the dough has rested, scoop out tablespoonfuls and roll them into a ball in your hands, then place on the baking sheet. You'll need to leave about 5cm of room around them (a couple of inches), as they'll spread. 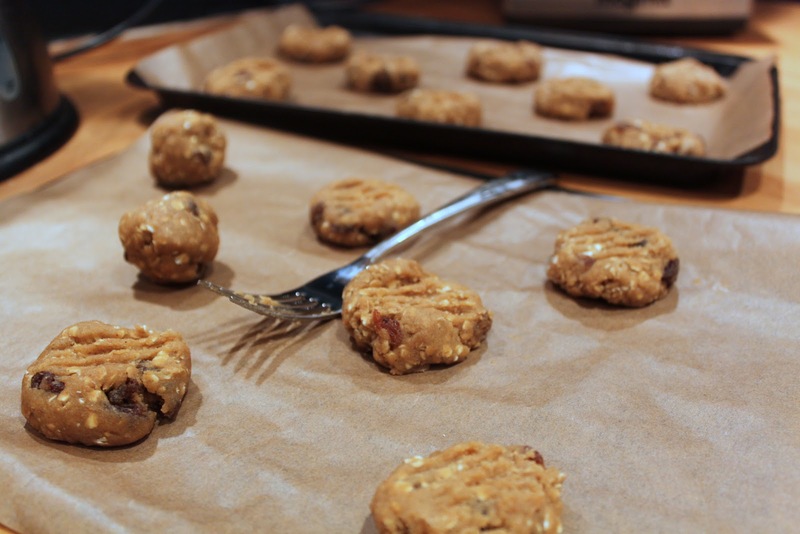 Press down with a fork to flatten slightly, then bake for 15 minutes or until slightly golden. 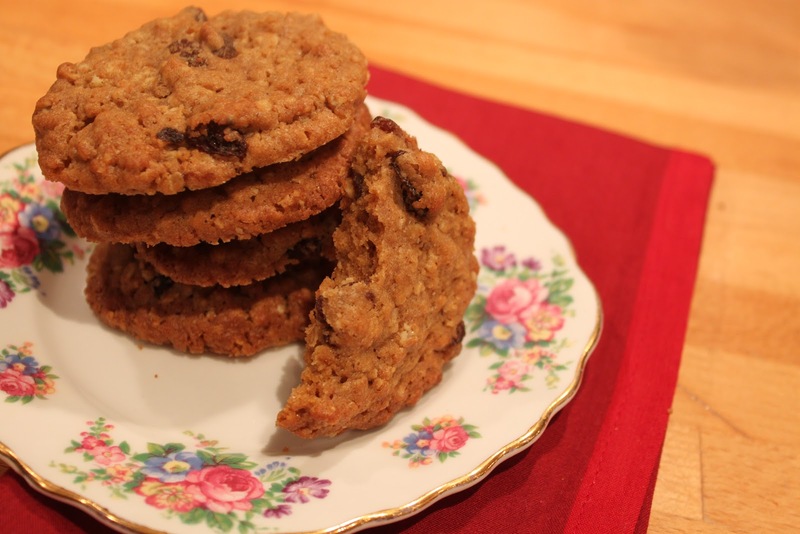 The cookies are very soft straight out of the oven, so leave them on the tray to cool for ten minutes or so before transferring to a wire rack. These were exceptional on the first day, good on the second, slightly tough on the third. But I think they'll freeze well, if you freeze them on day one (or freeze the uncooked dough). And we're back! Back from the turquoise Caribbean, 30 degree heat, blazing sunshine and ice-cold cocktails. Back from a place where the most stressful decision was whether to go for a sun lounger or a hammock (ans: hammock). Back from sandy toes and sandy everything else, a 20 minute sun-cream application process and a 0 minute hair and makeup routine. Back to dark mornings and dark evenings, mountains of accumulated work, tasks which people promised faithfully to take care of and then...didn't, late nights and jetlag. Sigh. Can I fly back to Mexico, please? OK, end of obnoxious whining. To tell you the truth, no homecoming could have lived up to such a holiday. Tulum, Hotel Rosa del Viento, Manuel with the drinks and as little English as we had Spanish, I salute you. It was just...so sunny! And the tostadas and guacamole were so good! And the Mayan ruins were so bizarre! (If your mental image is the Aztec Zone from the Crystal Maze, you're pretty much bang on). It was utter bliss. Even as my tan fades, I'll bask in the memories. We've never had a more relaxing holiday - and god, how we needed it. Back in the real world, with jetlag (mostly) conquered and all the sand emptied out of the suitcase, it's time to ease back into cooking for myself. And where a bottle of Sol and some prawn tacos might have been the norm in Mexico, back in Blighty it's the weather for soup. This chowder, from Jamie's 30 Minute Meals, ticked all the boxes. 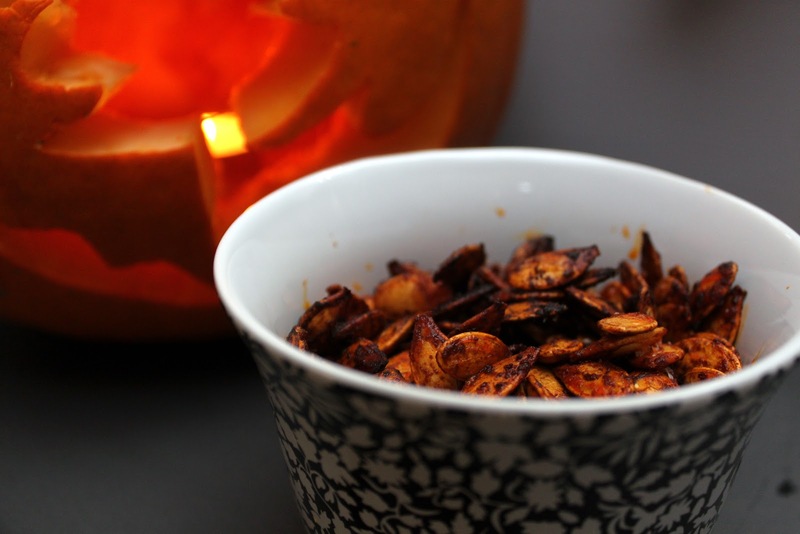 Super quick (as you'd expect), it was easy to prepare and absolutely delicious to eat. Honestly, it's almost annoying how good Jamie Oliver's recipes are. I flick through the book, tsking about how he's overstretching himself by bringing out new books every month and plastering his face all over telly; decide, grudgingly, to give one a go; then realize, without fail, that he's delivered another blinder. Big meaty flavours, quick and easy, satisfyingly chunky. With soup, a fire and Homeland on telly, home is almost as good as holiday. All I need is a cocktail, and at least I know where to get one. - a big handful of frozen corn. Fry the bacon, stirring often, in a large saucepan over a medium heat until golden. Our bacon always gives off loads of fat, so I didn't add any oil, but you can if you like. Add the spring onions and the raw potatoes, if you're using them (if you've got leftover cooked ones, don't add them yet). Cook for 3-4 minutes, stirring often. Add the frozen corn, haddock fillet, bay leaves, thyme, a few good grinds of black pepper and the stock. Put a lid on, and cook for 12 minutes. After that time, give it all a good stir (the fish will flake apart, but that's fine) and add the cooked potatoes, if that's what you're using. Cook for another few minutes, then add the cream and turn the heat right down. After a minute or so, roughly mash about half of the soup with a potato masher, and stir it through. Serve, eat, enjoy. If you've been following Dine At Mine recently, you'll have read that the Dine At Mine household has gone on holiday to Mexico for a week. Mrs Dine At Mine is currently lying on a hammock on the beach reading her book (or possibly having a sneaky siesta after that lunchtime bottle of Sol). So this is Mr Dine At Mine, otherwise known as Greedy Gusto, posting a quick blog while I shelter my delicate fair skin from the 30 degree heat. As we're in Mexico, you might expect a blog about the local food, and indeed our hotel does serve a delicious mixture of Mexican / Italian / American food. So we've had tortillas, pasta and even a few French fries over the first couple of days (though not all on the same plate - they don't go in for fusion cooking here). And it has all been delicious. 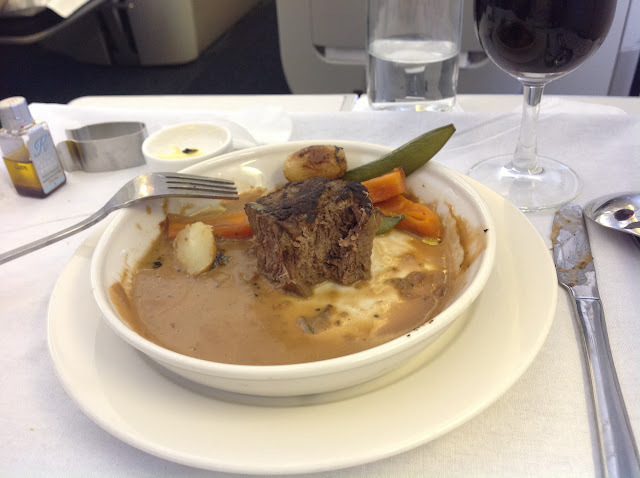 But instead of posting holiday snaps from our beachfront hotel, I'm going to post a few photos of the meals we were served on our flight from London to Mexico. 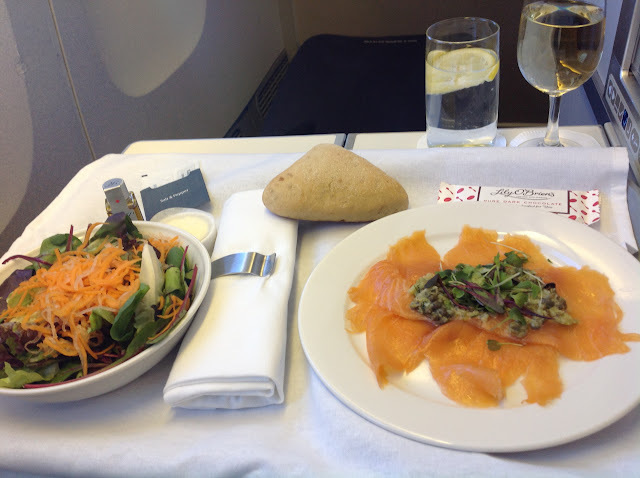 We were lucky enough to be flying Business class as we had saved up enough air miles, so I wanted to share with you the delights that you can expect on an 11 hour daytime flight in British Airways Club Class. Firstly of course we got access to the Business Class lounge at Gatwick airport. These lounges are best taken advantage of in the afternoon/evening, when you can help yourself to the various alcoholic beverages on offer. Our flight was at 10am, and we arrived in the lounge just after 7am. Too early for a drink? Not for Mrs Dine At Mine, who promptly ordered us a couple of glasses of champagne. They washed down nicely the beans on toast, Coco Pops, croissants, fruit and yoghurt that we helped ourselves to in the lounge. 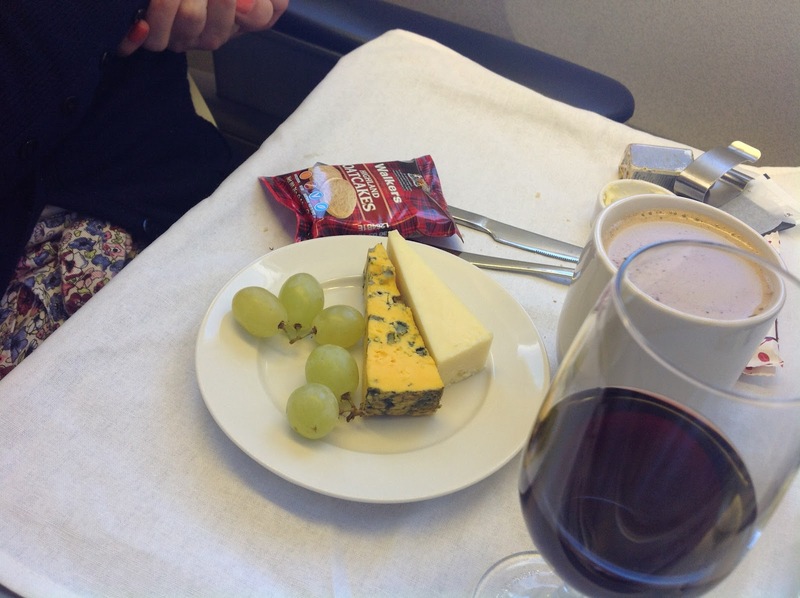 Once we boarded the flight, we were offered another glass of champagne before take-off (accepted), another glass of champagne after take-off before lunch (accepted), and then finally we got into the food. I don't have the patience to type out the menu (I'm writing this on the iPad, and honestly Google it's impossible to blog on the iPad! Please sort something out), so I've included a photo of the menu at the bottom. Hopefully you can read through that. In summary, the salmon starter was delicious, the fillet steak was grossly overcooked (see photo of grey meat) but the meat was good quality and the sauce was tasty, and the ice cream was surprising (given it wasn't on the menu). 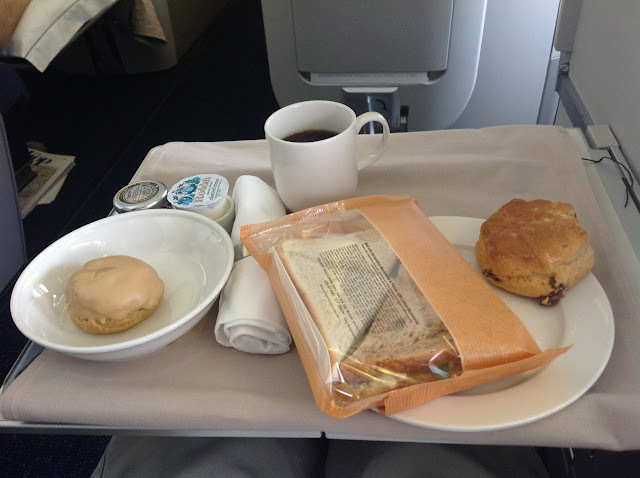 Afternoon tea at the end of the flight was a delight, with yummy sandwiches, warm fruit scones, proper clotted cream and jam. The only disappointment was a salted caramel choux bun that failed to impress us with its lack of flavour. 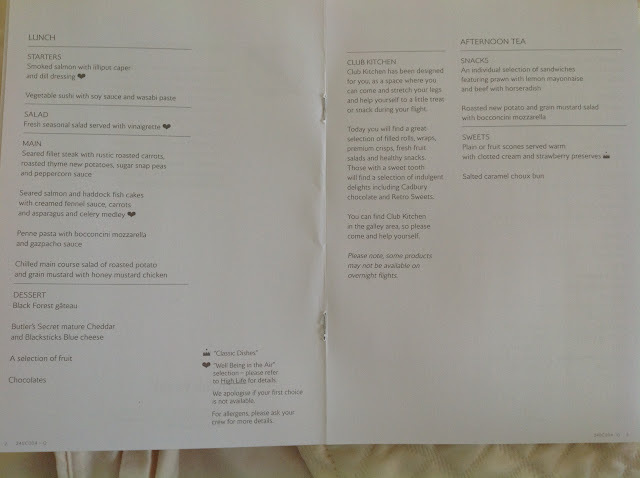 Ok, none of the food was cooked to restaurant quality (I'm looking at you, fillet steak). 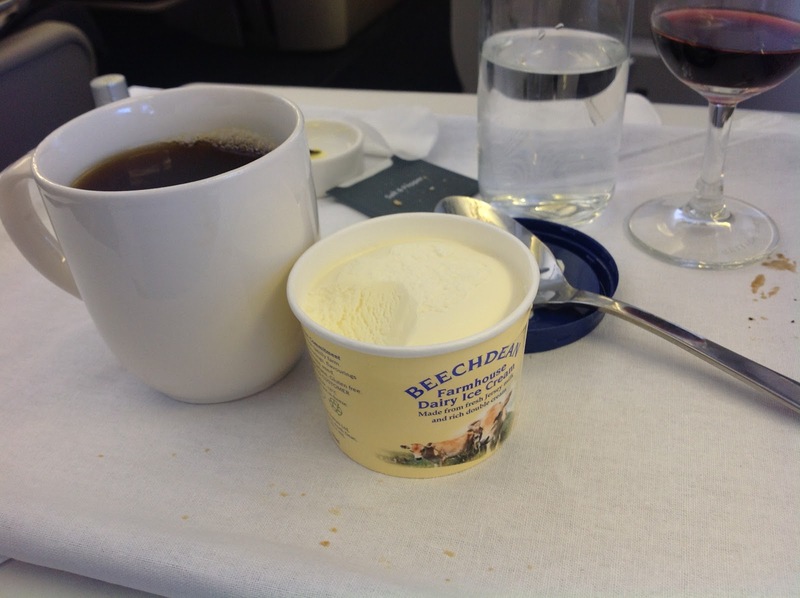 But served at 35,000 feet in our comfortable seats on the way to a tropical holiday - we were happy enough! Please consider this my out of office. Tomorrow, for the first time since our incredible (and now, depressingly long ago) honeymoon, Him Indoors and I will be jetting off out of the country for a very long-awaited holiday. Two weeks of eating, drinking, reading, snoozing, sightseeing and sunbathing. And, no doubt, scratching insect bites, applying aftersun to pasty British skin and realizing that we forgot something - don't know what but something - which is absolutely crucial. But at this moment in time, I can't focus on anything bad will may or may not happen in the next fortnight. I've waited for more than eighteen months for this holiday, and I'm going to enjoy every single second. Did I mention that it's 30 degrees and sunny in Tulum right now? Sigh. So while we're in bliss Mexico, this corner of the internet will be left to fend for itself. And this is the final recipe that needs blogging before I go - somewhere on the to-do list between "remember sun hat" and "chuck out anything from the fridge that will turn to cheese while we're away". Given that it's going to be up here for a few weeks until I get back, gabbling about taquitos and enchiladas and mosquito bites the size of my FACE, it's just as well it's a good one. This Wellington is a tried and trusted favourite, a reliable showstopper for (expensive but worth it) entertaining or an incredible special occasion treat. The effort: effect ratio is better on this than almost anything else we make - it's easy, relatively quick and can be prepared entirely in advance. The only real challenge is finding a bit of beef fillet big enough for your greed, that doesn't leave your wallet crying. Well, that and fighting it out for the biggest, rarest slices. So if you're looking for an amazing, foolproof, oh-so-delicious way to spend a few quid, I can definitely recommend this Wellington. If you want turquoise seas, palm trees and that big fiery orb in the sky which seemed to give Britain a miss this summer? Those will be found in Mexico. As will we - book in one hand, cocktail in the other, big stupid smiles on sunkissed faces. It's so close now, I can almost touch it. 12 hours until we fly! Start by heating a splash of oil in a large frying pan over a medium-high heat. Season the beef all over and quickly sear it on every side until browned, then set aside to cool. You're not looking to cook the meat at this stage, just to colour the outside and seal in the juices. Don't bother washing up the pan, you're about to use it again. Whiz the garlic in the food processor until finely chopped. 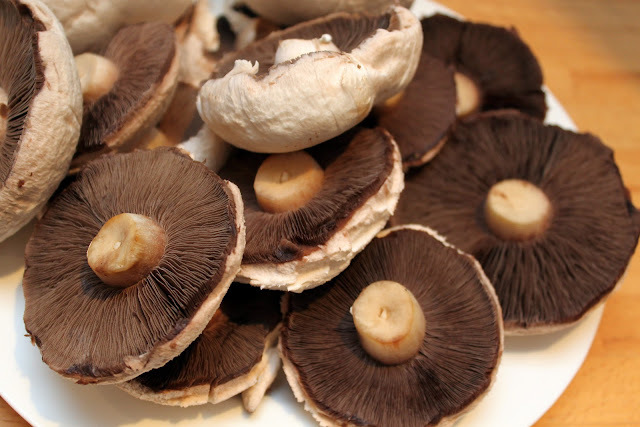 Peel or wipe the mushrooms, break into large pieces and add to the garlic in the processor. Blitz it until the mushrooms have become a puree. Put a medium heat under the frying pan and scrape in the garlicky mushroom mixture. Heat, stirring frequently, until the liquid in the mushrooms evaporates and the mixture is quite dry, enough to be squished together and hold its shape. For this quantity of mushrooms, it might take up to ten minutes, so be patient. Then set aside and let it cool down. Lay out a couple of big pieces of clingfilm to cover a worksurface, then arrange the parma ham on top, overlapping slices so that you get a big rectangle with no gaps. You want it large enough to wrap around the whole beef fillet. Smush the mushroom mixture on top, spreading evenly. Brush the cooled beef fillet generously with mustard (we went for grainy, Gordon says English) and place on top. Holding onto the edge of the clingfilm nearest you, tightly roll the mushroomy ham over and around the beef, into a tight sausage shape. Twist the ends of the cling film tightly, and put the whole lot in the fridge for at least 15 minutes to set the shape. Roll out the puff pastry until it's big enough to wrap right around the beef, and preheat the oven to 200C. Plonk the beef right in the middle of the pastry and roll it up, making sure that the 'seam' is underneath the meat. Fold the ends underneath as well, and carefully manoeuvre the wellington onto a baking tray. Brush the whole thing in beaten egg and lightly crisscross the top with a knife, then chill for another 5 minutes (or up to a few hours, if you like - we did). Egg wash again, then bake for 45 minutes to leave it properly rare, more or less according to taste. Rest for 10 minutes before slicing, then tuck in. We served it with hasselback potatoes, green beans and peas. Let me be honest. This post is purely and simply an excuse to blog my pumpkin, aka the best £1.50 I've spent in months. With my mum, a template from Florence Finds and a lethally sharp knife, I spent Sunday afternoon giggling wildly and regressing twenty years. And I don't regret a single second of it. Look at that pumpkin! Look at the bat in the moon! The stars! The spooooookiness! The logical next step is to dig out that terrible 90s film of the Worst Witch (with Tim Curry and Diana Rigg) - which we used to watch every Halloween without fail - curl up in the candlelight and dye some baked beans green. Which my mum did at a particularly noteworthy Halloween party of our youth. Even when you know they're just baked beans, it's impossible to force yourself to eat them. Slime! Mucus! Mould! Gross. Other themed foodstuffs from the same party, according to the list she dug out and brought along: two types of eyeballs (frozen grapes and pickled onions); fried monsters and dried out tongues (Monster Munch and Quavers); blood-stained fingers (hot dogs with ketchup) and shrivelled toes (mini sausages); ectoplasm jelly and compost cake tiffin. Ah, we made our own fun back in those days. And even though I'm now a grown-up of advanced years, I really want to do it all again - fancy dress, comedy canapes at all. At least, that's what my Pinterest seems to suggest. And Pinterest never lies. But back to the present day, and my final trick - gouging out the flesh rather than cutting right through. Look at this boo! It still makes me snigger. Between the pumpkin, the seeds and the variety pack of chocolates, we're all sorted for Wednesday and any marauding kids who want to make their own memories on our road. As long as we don't eat all the Maltesers first, that is. Happy Halloween! Simply toss all the ingredients together, spread out in a thin layer on a baking tray and toast in a 180C oven for half an hour, stirring once. Operation kitchen is a-go-go! Despite spending the weekend in beautiful, best beloved Oxford (insert sigh for the autumn leaves, the honey-coloured stone, and the roaring fire in the Kings Arms), we have been charging on and slapdashing through and progress has been made. New cupboards are up (almost)! Old ones have got new doors (mostly)! Backsplashes have been painted (sort of)! At least five of the tins and jars have been cleared off the table (don't mention the rest)! So there's nothing new today, just an overdue write-up of the ice cream I promised you last time. Like so many ice creams around this house recently, it's another adaptation of our basic vanilla but truthfully? Brucie-stylee? This might be my favourite. I know, I'm easily swayed - and the fact that cinnamon tastes like autumn heaven is just a small part of it - but this was so perfect, so suitable for an apple pudding that I was blown away, far away from all my previous favourites. What do you want me to say? I'm fickle. Just maple syrup, butter and cinnamon, melted together into a torrent of sweet-scented goo, swirled through creamy, light vanilla ice cream. I don't need to say anything more, do I? I just need to go back into the kitchen debris and find the ice cream scoop. I'm sure it's in there somewhere. 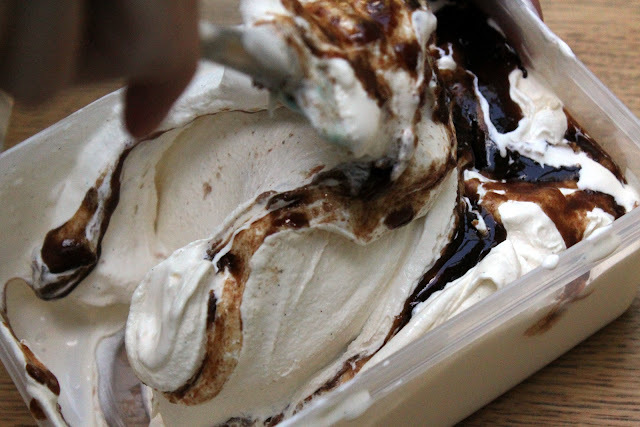 As with the plum ripple and stracciatella, the basic vanilla ice cream comes from the Ben & Jerry's book. The cinnamon swirl comes from this website. Whisk the eggs in a large mixing bowl (or freestanding mixer) for about 2 minutes or until very light and fluffy. Keep whisking while you gradually add the sugar, then whisk the whole thing for another couple of minutes until totally blended. Pour in the cream, milk and vanilla, whisk again, then transfer to an ice cream maker and churn. This one really appreciates a long churning time - it's in the final few minutes that air is incorporated, making the final ice cream light and soft - so give it a good 25 minutes. While the ice cream is churning, heat the syrup, butter and cinnamon over a low heat until the butter is melted, the cinnamon smells amazing and the mixture is bubbling. Turn the heat off and let it cool down a bit. Once the ice cream has finished in the machine, slop it into a big Tupperware and pour the cinnamon goo on top. Swirl it all around two or three times, then transfer to the freezer. Holeymoley, we're actually doing it. After speculating idly for months about whether we should redo the kitchen - what, when, how, and what again - it's happening, right now. Getting a handyman round for a quote turned into "actually, I'm free next week", which turned into a Sunday evening spent emptying and breaking apart our cupboards and a Monday morning waiting in with biscuits and teabags. On Monday evening we came home and, as if by magic, our kitchen renovation had started. Without us really noticing, and definitely without any form of sensible planning. And it's happening so fast! All of a sudden, those depressing greige tiles have vamoosed. Those cabinets I whinged about, full of holes and far too small? Gone! The extra sockets we needed? Installed in the blink of an eye! Our dripping tap has been replaced with a shiny new one, our dismal halogen lights swapped for a pendant light (albeit one we had to order in a fiendish hurry, and which almost didn't turn up in time). Now the handyman has gone and we're left with newly replastered walls, piles and piles of dust, and food (in jars, boxes, tins and packets) covering every surface in the house. Turns out those cabinets I complained about really did hold quite a lot, if you take it all out at once. But that kitchen is now history and last night after work, fuelled by meatballs, we spent two hours in Ikea buying the future. Incidentally, did you know that Ikea is just as busy at 10pm on a weeknight as it is on a Saturday afternoon? Me neither! Anyway, with that shopping experience safely under the belt and in our nightmares, we now have a huge pile of new cupboards, doors, hinges, deco panels, plinths, drawers, moulding and drawer dampeners waiting for us to build and erect them, not to mention a tin of blackboard paint ready to be slapped onto the backsplash. All in what has been, for both of us, the busiest and most stressful work week in the whole year, topped off with going out this evening, entertaining (!) tomorrow evening and going away for the weekend. Maybe we should have thought this one through a bit more carefully? While the new kitchen waits impatiently in the wings, let's remember what was (as it turns out) the last dinner for friends to emerge from the old one. Namely a cosy evening on Saturday with pot roast beef in red wine, crispy parmentier potatoes and, most importantly of all, proper pudding. After mentioning toffee apples in the last post, nothing could quite get them out of my head - and in the middle of a tedious work meeting, a blinding ray of inspiration struck. Toffee apple crumble. I don't really need to say any more, do I? Ok, ok, fine - I googled it, found a recipe, fiddled slightly (no figs, no pears, no spelt, just pure toffee and apple), and created what is possibly my favourite ever crumble. In other words, my favourite ever pudding. My only slight quibble was over the inclusion of orange juice, which I found a bit overpowering (although clearly not so overpowering that I didn't manage seconds). Plus, you know I'm a sucker for crumble, so I could have handled a higher crumble: fruit ratio. But the others didn't seem to object - although they may just have been being polite - and our huge quantites were not only finished, but licked clean. I'll be trying it again as soon as our kitchen is back up to speed (maybe omitting the orange altogether, or replacing with apple juice) but in the meantime, I have the warm glow of memory to keep me going, and the dazzling light of inspiration ahead. Cross your fingers that we'll get at least one cupboard built and installed before long! I don't want to have to wait too long for my next dose of crumble. 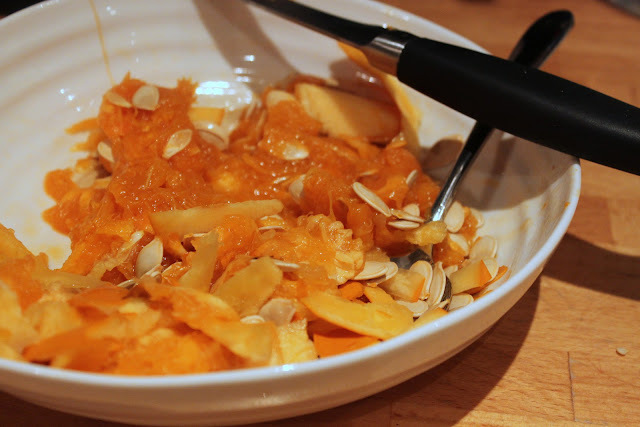 If you want to make this in advance, prepare the fruit and the crumble separately and keep them in the fridge, pouring the crumble over the fruit just before cooking. If you want to eat this as soon as humanly possible, preheat the oven to 180C now. Put the butter, sugar and orange juice (if using) in a large saucepan and heat gently for 5 minutes, until the mixture is melted and bubbling. Add the fruit, stir it all around and cook for 10 minutes or so, until the fruit is starting to soften and the toffee sauce is looking delicious. Transfer to the dish you want to cook it in, making sure you get all the sauce, and set aside. In a big bowl, rub the butter into the flour with fingertips (or you could nuke it in the food processor), then stir in the oats and demerara. Taste it just to make sure it's good. Yum. Pour the crumble over the fruit, bake for 30 minutes and serve with ice cream, cream or custard. We went for cinnamon swirl ice cream, which will be making its way to this blog in the next few days.